Printed by the Finnish Treasury. † In Scott  the 1856 issues (Sc1 and 2) are specified with wove paper and the 1858 Sc3 with vertically laid paper. Gibbons  differentiates paper types within the issues. 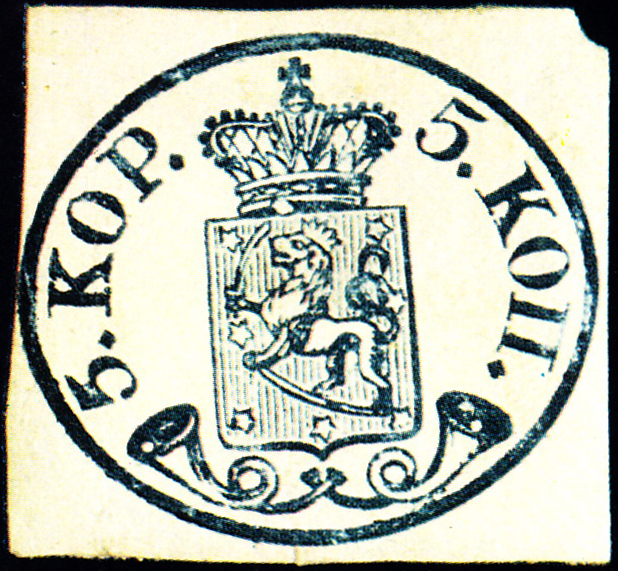 These stamps were issued following an Imperial Edict dated March 1, 1856. The stamps were issued provisionally to test demand for distictively Finnish stamps as opposed to Russian stamps. Each oval printed about 3 mm. apart, so large margins should be required for high quality stamps. However, as you can see, these stamps are quite rare. The stamps were printed on a small press at the Office of the Treasury in Finland. The was not large enough to accommodate a complete sheet, so the stamps were printed using the "work and turn" method; the first horizontal row of ten stamps was printed, then the paper was turned to print the second and final row. Therefore the layout of the tête-bêche pairs is often uneven. Sources: ScS , SGP11 .